We’re a family business setting a new standard of house building in Lincolnshire. When it comes to quality we’re leading the way. Last year we took standards of building materials to another level by working with British Gypsum to incorporate innovative products like super-strength plasterboard, magnetic walls and soundproofing in some of our new developments. Now our homes truly are creative spaces in which homeowners can live, work and play. 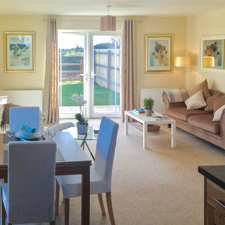 Could Cherry Tree homes be the best new builds in Lincolnshire? There’s something special happening at Cherry Tree Homes’ latest two developments in the Lincolnshire villages of Cherry Willingham and Langworth. By including features like super-strength plasterboard, magnetic walls and soundproofing for modern families. Our Wesley Road scheme in Cherry Willingham is coming to an end. We have one four bedroom house remaining. Please contact us to arrange a viewing.